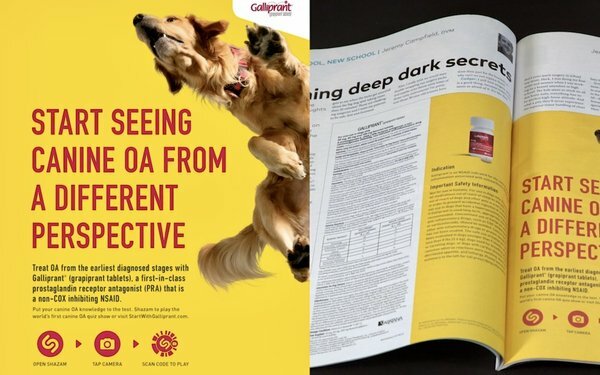 The brand needed to teach veterinarians about Galliprant (grapiprant tablets), a first-of-its-kind non-steroidal anti-inflammatory drug that uses targeted action to treat canine osteoarthritis (OA) pain and inflammation. Simply put, Galliprant is a revolutionary OA treatment for dogs. Research determined the best way to reach it target audience of veterinarians was through trade print publications. However, the reasons Galliprant is so revolutionary are very technical and not easily explained in a print ad. Instead of serving up communications laden with complicated bullet points, it created Shazam-enabled print ads and challenged veterinarians to test their OA knowledge with a quirky quiz show. Canine Q, the world’s first canine OA quiz show, engaged veterinarians’ competitive spirit while explaining the benefits of Galliprant. The quiz was extremely well received by veterinarians. Engagement with the Shazam code was 115% over projection. Pair premium ad placements with impactful digital technologies to turn complex information into entertainment. Pique your audience’s love of a good challenge with a quiz or a contest. This was a finalist in the Print category in MediaPost’s 2018 Creative Media Awards.